are multinationals overlooking the impacts their activities could have on fragile ecosystems? This question is being repeatedly asked by many specialists, with the spotlight on Pepsi Foods Limited (pfl) -- a subsidiary of the multinational PepsiCo. The company is cultivating an alien seaweed, Kappaphycus alvarezii, on a largescale in the Palk Strait, near the Gulf of Mannar . K alvarezii, a species of Eucheuma, is a source of carrageenan that is used by the food industry. Carrageenan forms gels that improve the viscosity of food products. It sells at Rs 1 lakh per tonne. So what's wrong with growing the harmless looking multi-cellular algae? Critics contend that it is 'exotic' and after adapting to local conditions, it may become an invasive species. The weed is being cultivated close to the Mannar Marine Biosphere -- a biodiversity hotspot. The marine system is an open one, and there is a connection between Palk Strait and the biosphere. According to a marine biologist from a Chennai-based non-governmental organisation, 117 species of seaweeds found in the Gulf of Mannar would vanish if K alvarezii overtakes. "Examples of rapid proliferation in India are Prosopis juliflora, Eichhornia crasspies, Lantana camara and Parthenium hysterophorus ." But some scientists are confident about the development. "One species of Eucheuma was reported from Okha, Gujarat, and another species was reported from the Andaman and Nicobar Islands. Therefore, it is native to India," says Umamaheshwara Rao, a leading marine algal taxonomist based in Visakhapatnam. However, in a paper ' Experimental field cultivation of Kappaphycus alvarezii at Mandapam region', published in the journal Seaweed Research and Utilization in 2002, Bhavnagar-based Central Salt and Marine Chemicals Research Institute (csmcri) -- the organisation from which pfl acquired the know-how of cultivating the seaweed -- claims that Eucheuma is "exotic to Indian waters". As per the Convention on Biological Diversity, after habitat loss, the second most important factor leading to loss of native species is introduction of alien species. Research shows that cultivated seaweeds eventually escape from farms and set up free-living populations. But V Krishnamurthy, director of Krishnamurthy Institute of Algology, Chennai, asserts: " K alvarezii has prospered in Hawaii, but didn't spread to other sites." pfl started its cultivation about two years ago. Currently K alvarezii is reproducing through vegetative propagation. So long as this continues, there may be no danger. "But once this species starts reproducing by spores, which it will eventually, then the entire Gulf of Mannar would be taken over," says the marine biologist. At present, salinity levels and the marine temperature are unsuitable for spore propagation. But if the temperature were to rise slightly, it would provide the right conditions. Opponents claim that nowhere in the world has commercial cultivation of seaweed been done with alien species. However, for some, the lure of some bucks is enough to give a clean chit to pfl. 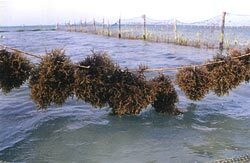 "Cultivation of K alvarezii will generate income and ease pressure off on natural seaweeds," asserts P K Ghosh, director of csmcri. If the situation is not soon resolved, the country may face a catastrophe of unimaginable scale, as pfl plans to extend its area of cultivation from 100 hectares to 5,000 hectares.